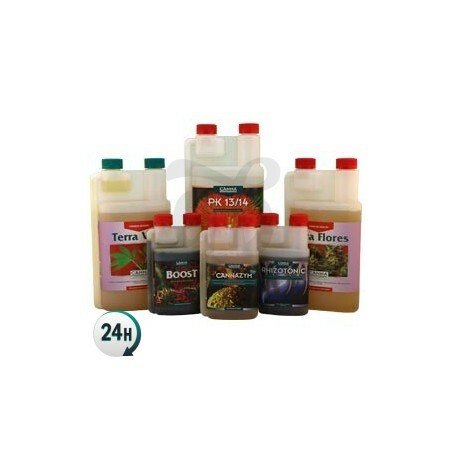 Fertilizer Kit by Canna includes all the fertilizers you need to obtain beautiful buds with a couple of outdoor plants or in a square metre, indoors. Fertilizer Kit by Canna comes with first-class fertilizers to grow marijuana plants and supply them with what they exactly need at each stage to develop. 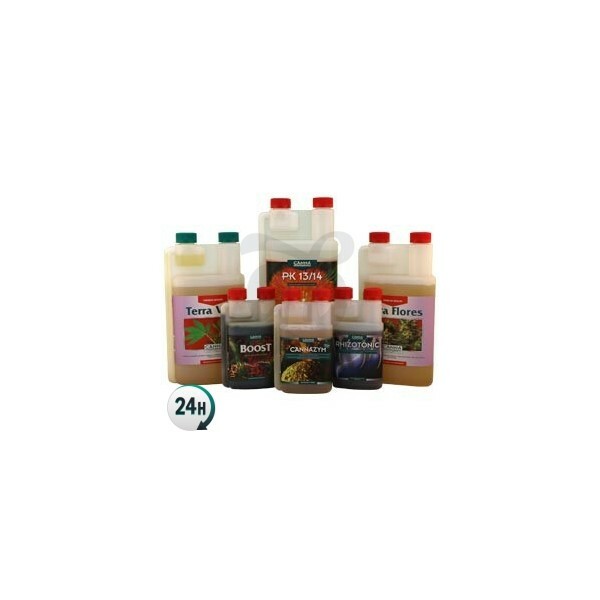 This collection of fertilizers will ensure excellent crops both indoors and outdoors. It contains a growth fertilizer, a root stimulator, an enzyme complex, a flowering stimulator (that provides extra energy to produce flowers), a base fertilizer for the flowering and a supplement to make the buds gain weight. Terra Vega is a fantastic organic-base fertilizer with all the elements needed for a vigorous growth that will form very large plants in a short time. Rhizotonic is a root stimulator that will multiply the water absorption surface, considerably increasing the nutrient absorption ratio, what translates into a burst of the plant’s growth. Cannazyme supplies different enzymes that will activate the micro-organisms present in the growth medium and will decompose the remains of organic matter, transforming them in assimilable sugars. 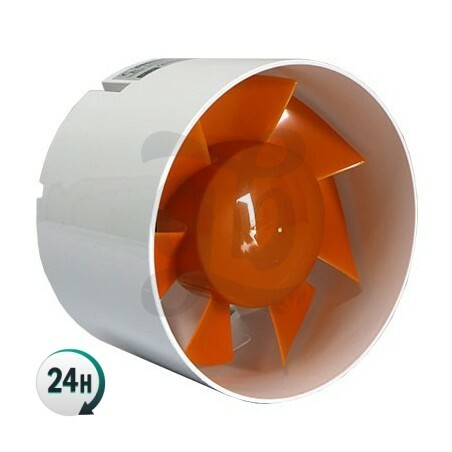 Cannaboost Accelerator is a strong flowering stimulator that works inside the plant, accelerating the formation of chlorophyll and the transportation of energy through the plant. 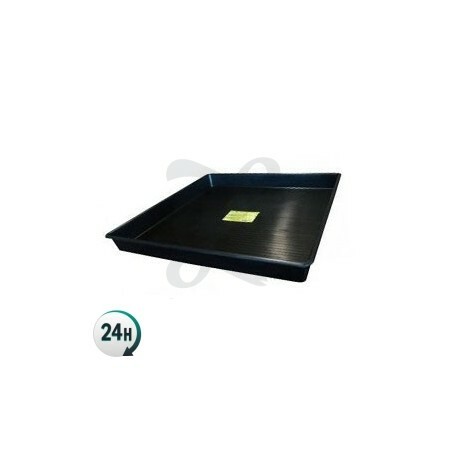 Terra Flores is a base fertilizer for the flowering that provides all the necessary nutrients to make sure that your plants are very healthy during the flowering stage, forming long colas of buds. PK 13/14 is a powerful fertilizer that is used to make the buds gain weight, supplying large amounts of phosphorous and potassium by the end of this stage, so the flowers keep growing tight and heavier. With the Fertilizer Kit by Canna, you’ll ensure that your plants won’t lack any nutrient. You’ll have, at the reach of your hand, all the best fertilizers from one of the most experienced makers in the world. To obtain the best results, check the crop list provided by Canna. Buenos fertilizantes, sencillos de usar, limpios, las nenas lo agradecen.